رفاعی, رامیار, سامتی, مرتضی, سید صالحی, شهرزاد, رفاعی, ژیار. (1396). کنترل فساد و سرمایه گذاری مستقیم خارجی: شواهدی از داده های پنل. سیاست‌های راهبردی و کلان, 5(شماره 19), 80-100. رامیار رفاعی; مرتضی سامتی; شهرزاد سید صالحی; ژیار رفاعی. "کنترل فساد و سرمایه گذاری مستقیم خارجی: شواهدی از داده های پنل". سیاست‌های راهبردی و کلان, 5, شماره 19, 1396, 80-100. رفاعی, رامیار, سامتی, مرتضی, سید صالحی, شهرزاد, رفاعی, ژیار. (1396). 'کنترل فساد و سرمایه گذاری مستقیم خارجی: شواهدی از داده های پنل', سیاست‌های راهبردی و کلان, 5(شماره 19), pp. 80-100. رفاعی, رامیار, سامتی, مرتضی, سید صالحی, شهرزاد, رفاعی, ژیار. کنترل فساد و سرمایه گذاری مستقیم خارجی: شواهدی از داده های پنل. 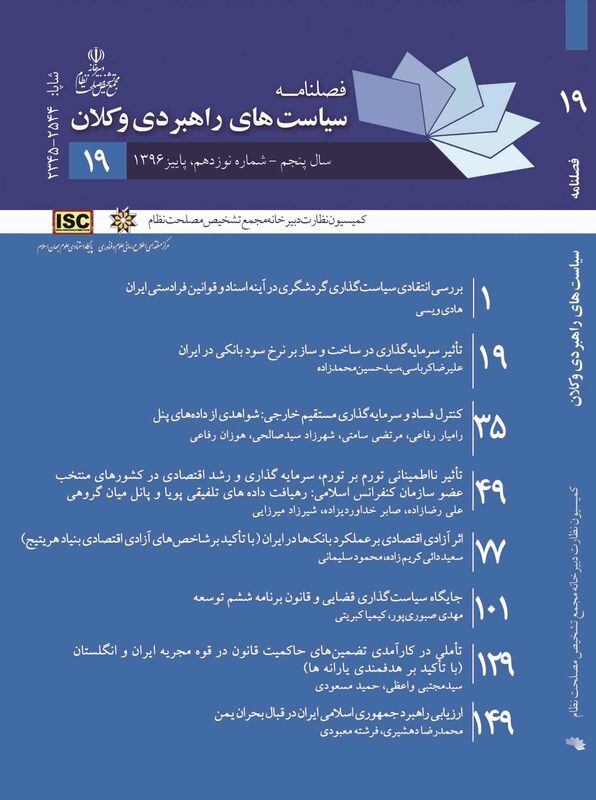 سیاست‌های راهبردی و کلان, 1396; 5(شماره 19): 80-100. This paper examines the impact of corruption on foreign direct investment (FDI) By using panel data approach and fixed effect estimation Over the period 1985-2014, In order to choose between different methods (Pooled Least Squares (PLS), fixed effects, and random effects (RE)), Chao (F. Limer) and Hausman tests are used. The results show that corruption not only reduces investment but also changes the composition of investment in countries that are the origion of investment flows. It presents two key findings. First, corruption results in relatively lower FDI from countries that have signed OECD Convention on International Business Transaction. Second, corruption results in relatively higher FDI from countries with high levels of corruption. This suggests that investors who have been exposed to bribery at home may not be deterred by corruption abroad, but instead seek countries where corruption is prevalent.